Is it possible that we don’t give Michael Kors his due when it comes to handbags? I think it might be. Or perhaps the problem is that his brand doesn’t emphasize it enough – I’m not exactly sure what the issue is, but the brand hasn’t “caught” as a major power in handbags like one would expect when you consider the huge financial and marketing arm that the brand has behind it. Sometimes you look at a bag and know immediately what it reminds you of, without having to give it much thought or effort. Those are my favorite bags – it’s like they come with a blog post built-in for my convenience! And really, it’s thoughtful for designers to help me out like that. Who said that fashionistas never think of others? And today, fake-tanned mensch Michael Kors is here to help with the Michael Kors Runway Clutch. 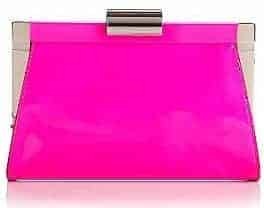 The little evening bag has the distinct look of the late 80s and early 90s to me – an era of bright colors, strong shoulder pads, and shiny accessories. 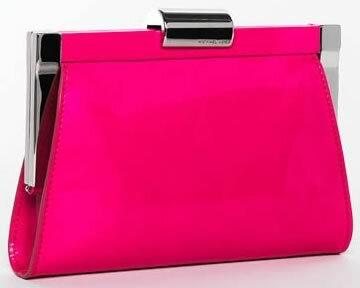 Patent neon pink is probably one of the strongest color statements a designer can make with a bag, and a shade like this references a very specific period in time – about 20 years ago. The strong edges at the top of the clutch, combined with the super-shiny polished silver hardware, remind me a lot of the ‘supermodel’ era – when Cindy, Christy, and Naomi strutted the catwalk in the things with huge shoulder pads and Kate Moss was just another skinny British chick. Such clear references combined with such clean lines give customers a great way to incorporate a retro trend in a super stylish way. Buy through Neiman Marcus for $595. I got an opportunity to take a look at some handbags the other day with a friend of mine that’s in to fashion, but doesn’t WORSHIP bags the way that a lot of the ladies here do. And I realized that sometimes, it’s good to get some perspective, because without it we might miss things. For example, I might have missed the Michael Kors ID Chain Shopper. A lot of people don’t pay much attention to Kors’ bags, and he’s had a misstep or two in the past, but I’ve seen his last season or two become much stronger and more drool-worthy. 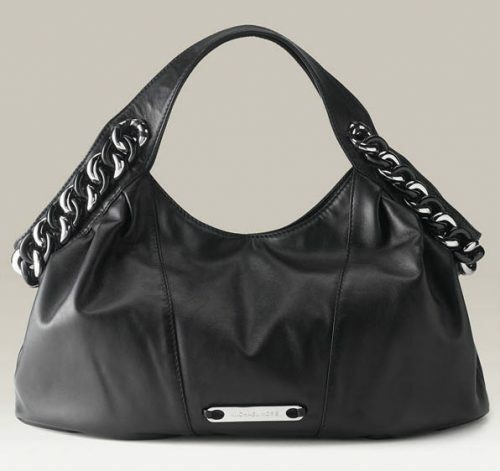 This bag I like in particular – the multi-material chain is huge and industrial, which gives the smooth, soft black leather a rocker edge without being over-the-top or over-designed. 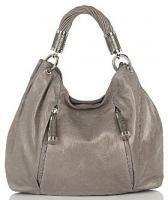 The bag is exceedingly simple while still exuding tons of attitude and style, and that’s not an easy balance to strike. The version with the all-plastic chain reminds me a bit of some recent Chanel collections, but I’ve never seen them do a chain with more than one material, and I actually like this bag better. It’s more accessible, less gimmicky, and certainly at a much better price point. Buy through Nordstrom for $995. You know what I love? An exotic bag of any kind for under a grand. It’s hard to come by, even in snakeskin, and particularly from a well-known designer. Well, the Michael Kors Templeton Snakeskin Clutch meets all of those requirements. 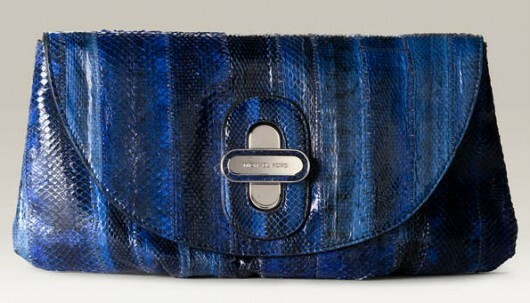 It’s a beautiful cobalt clutch made of real snakeskin that any of us would be lucky to have in our closets. And it’s not tiny, either. It’s a full foot wide and looks like it would easily be big enough to hold my BlackBerry, oversized key ring (I’m a janitor at night, don’t tell anyone), and a lip gloss or two. And then there’s the great color; it encompasses shades shades of bright and deep blue and several in between, and would look amazing with almost any kind of sundress, particularly a white one. It’d also work during colder weather – just imagine how much it would pop when worn with a black dress and a great pair of boots. The price is great for an exotic from any designer you’ve ever heard of, and it might still be more than I want to pay for a clutch, but I’m going to ignore all of that and just imagine taking it out this weekend. Buy through Nordstrom for $895. Spring has sprung, PurseBloggers! It’s officially here! Well, it’s been officially here for a few days now, but I’m a blogger, you can’t expect me to be up on things like dates and calendars. That wasn’t in my contract. But I’ve crawled out from under my rock (or, more realistically, off of my couch), looked outside, and realized that the sun and warmth I’ve been bellyaching for for months is actually OUT THERE. RIGHT NOW. Who would have known? And more importantly, why don’t I have a spring clutch already? In Athens, everyone goes out at night. We’re a college town, and the bar scene is the basis of our social structure (and the wind in most people’s wings). Since I now work from home, a daytime bag for every occasion isn’t necessarily crucial (since, let’s face it, I don’t get out that much), but a nighttime bag? More important than ever. 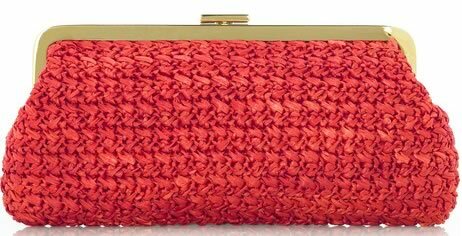 And for that purpose, I submit the Michael Kors Woven Raffia Clutch for your consideration. Fun color? Check. It’s a red with both pink and orange undertones, making it eternally sunny and capable of matching and coordinating with numerous other colors. Appropriate material? Check. Tightly woven raffia is the most obviously warm-weather fabric out there, and the weave on this is a bit different than most and interesting to look at. Correct size? Check. It’s not too big to lug around all night, but it’s not too small to fit my giant, janitor-sized key ring. Reasonable price? Check – sort of. In the broad scheme of bags, it certainly isn’t bad, but I have some kind of mental block against shelling out cash on any clutch I’d actually think about using, since I would inevitably destroy it. This is a bag I’d consider ponying up for, though. Buy through Net-a-Porter for $350. You all know how great it is to have a staple in your wardrobe. Whether it is that little black dress, your favorite pair of jeans or a sweater that hugs your curves in all the right places, there is something you just can’t live without. As many handbags as any of us have, for the most part, I think there is probably one we reach to more often than others. There is that handbag that works for so many occasions, holds up well, and looks great. 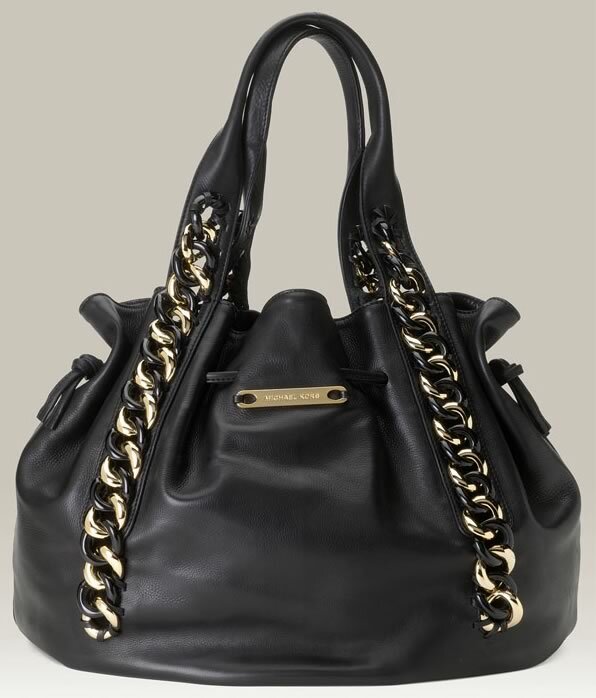 The Michael Kors Id Chain Tote is definitely a contender in the staple handbag category. Now, not only can you have a new go-to handbag, but you can also be on the cutting edge! 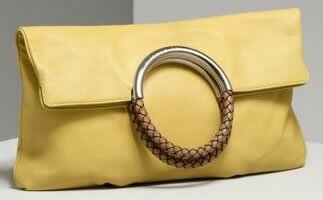 There are limited quantities of this handbag and it can be pre-ordered from the Resort 2009 collection. 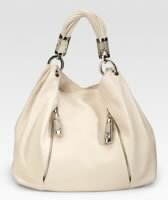 The slouchy leather tote has a gathered drawstring top, beautiful chain detailing which extends from the base of the handles to the bottom of the bag. And of course, there are several pockets, plenty of room for anything you need to carry around and the leather – GORGEOUS! I love the fact that someone in their 20s could be seen carrying it just as someone in their 60s might. When handbags can cross generations, you know you have a great bag on your hands. Yes, it will set you back a bit, but since this purse will stand the test of time, I think it is a worthwhile investment. Buy through Nordstrom for $1495.